For avid gardeners and chefs, onions are a beneficial addition to a garden since they are a constant staple in the kitchen and can be kept fresh for months. As a cool-season vegetable, onions are best planted in the spring season. Onions can be planted in full sun or shade, depending on the variety. Green onions should be planted in the shade, while all other onion varieties should be planted in sun. Layer 2 lbs. 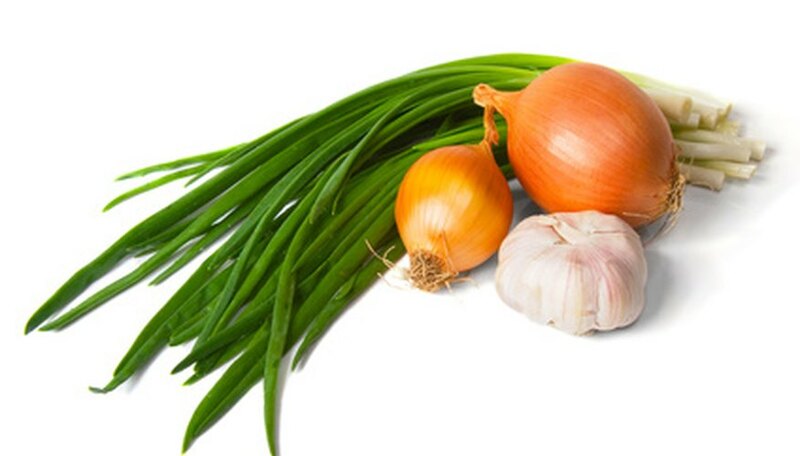 of 16-16-8 fertilizer per 100 square feet over the area you are going to plant the onions. Rake the fertilizer into the soil, at least 6 inches deep. Dig holes in the soil that are 2 inches deep with a diameter a little wider than the onion transplant, no matter whether you are planting green onions or large bulb onions. Space onions at least 4 inches apart for full maturation. Plant each transplant into a separate hole. Pat soil around the top of the bulb firmly but gently. Water the planting area generously to soak the soil. Layer 2 inches of mulch over the onions beds that are in full sun. Green onions planted in sun do not need mulch. Water the planting site at about 1 inch per week for green onions in shade, 2 inches per week for onions in full sun. Layer 1/2 cup of 21-0-0 fertilizer onto the onions once they are 6 to 7 inches tall. Use 1/2 cup per three dozen onion plants. Make sure to layer the fertilizer around the plants, not directly on them. Fertilize one more time when the bulbs grow twice as large.